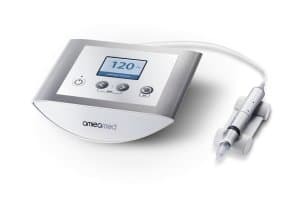 Extremely high-level medical microneedling to clinically improve post acne scaring, in particular, to reduce the depth of the acne scars and normalise the skin structure. The needles can be operated at a frequency of up to 150 punctures per second. The protrusion of the needle can be set on a precise scale.